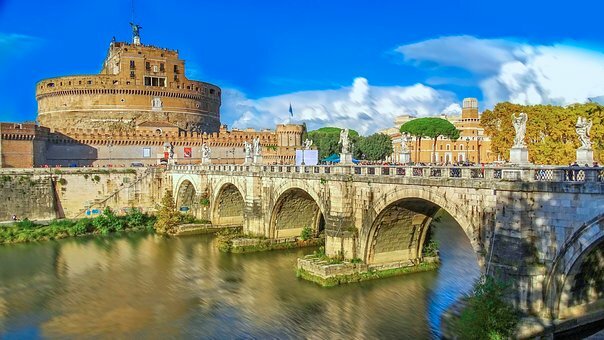 Explore one of the most beautiful countries of the world with Italy Travel Tours, a dedicated tourism company, which seeks to offer you just the kind of experience you are looking for. We, at Italy Travel Tours organize special escorted and independent tours for our guests. From Rome, Venice, Naples, Florence as well as Tuscany to the Amalfi Coast, the gorgeous Northern Lakes, mythical Sicily and much more, discover a different Italy with our distinguished guides. Our company understands the interests and needs of visitors from across the globe and we know well how to satiate their wonder thirst while keeping in mind the value of their time and money. On our escorted and independent Italian tours we thrive to provide you the right kind of thrill and pleasure of travelling. 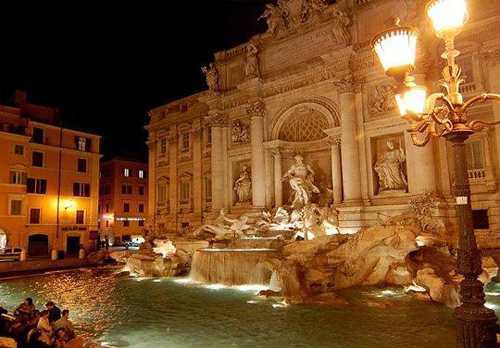 A trip to Italy with us will surely appeal to your intellect making it a learning experience. All our tour packages are designed by experts who are well versed with the topography, heritage and the culture of Italy. Before you land in Italy, visit our website to find details of the various packages being offered. A host of guides are waiting to take you on a wonderful ride through various attractive spots like the spectacular Amalfi coastline, romantic hill-top towns of Tuscany, exotic cave dwellings in the south and the celebrated Renaissance cities of Florence, Verona and Venice. Italy has all the features that a traveler or a tourist would like to experience in a vibrant country. Its exquisite cuisine and bustling night life almost fits the bill for a person who wants to enjoy a trip to the fullest. 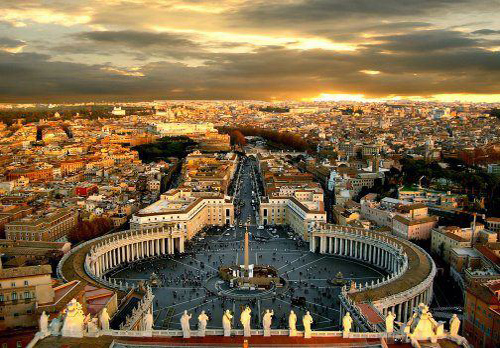 Italy surely earns the credit of having the maximum number of World Heritage sites recognized by UNESCO. Sun soaked beaches, serene and tranquil lakes, stiff mountain ranges cutting across the length and breadth of the country, you can find them all in Repubblica Italiana or simply Italy. It is a country of immense historical importance. It’s definitely a must visit for art lovers due its treasure trove of unparalleled world heritage sites. Traveling in Italy every place is a must visit, be it the Trevi Frountain of Rome or the Amalfi coast the list is just never ending. The Colosseum in Rome, the Leaning Tower of Pisa or the remains of the Roman city of Pompeii should surely feature in the list of tourist hot spots in Italy. Join us on our Italy tours and visit among other places are Towers of San Gimignano, Manarola, Majestic Lake Como, charming Positano, Piazza del Campo, Santa Maria del Fiore and the Canals of Venice with its many ornate palaces and numerous little bridges. Enjoy a romantic trip with us. 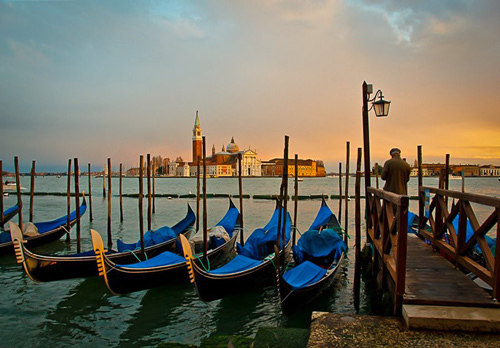 Breathtaking beauty, awe-inspiring architecture and romantic gondola rides. Welcome to “The City of Water”. Venice, a city crisscrossed by over 150 canals. Be it a honeymoon trip, a brief break from busy work life or simply wondering away, the stunning city has something for all visitors. You will love to forget the rest of the world while relaxing in Piazza San Marco or taking a boat ride on a full moon night. There are more tourists than residents living in this magical city, one of the top tourist attractions of Italy, so visit our website to find more about the convenient Venice package that suits your needs the most. Authentic San Gimignano, known as medieval Manhatten, is a hamlet in Tuscany with 14 stone towers. Originally there were over 70 towers built during the supremacy of San Gimignano to protect the town from attacks of intruders. Though San Gimignano’s power gradually decreased, many of the towers survived the withering of time. 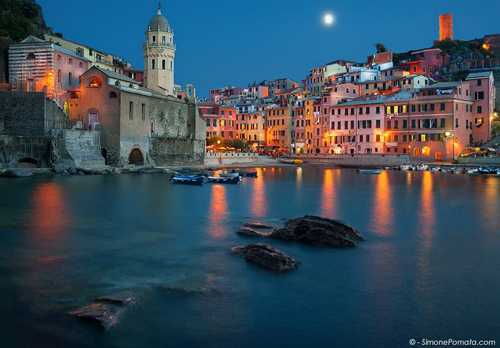 An other highlight of your tour in Italy is the Italian Riviera with its celebrated Cinque Terre Coast. Five beautiful villages demark the ‘Five Lands’. 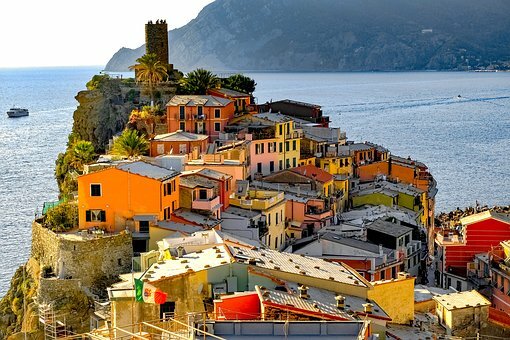 Cinque Terre still holds on to old tradition and infrastructure plans, which adds to its charm. Modes of communication from one village to another are boats and trains. Outsiders cannot easily enter these villages sheltered by steep rocks. From the surrounding mountains one can enjoy a spectacular view of the Mediterranean Sea. Our guides will help you flip through the pages of history as you travel around these places. Not too far from Cinque Terre is the town of Pisa famous for its Leaning Tower, a tilted jewelry box. It took over 150 years to build it. Initially the very foundation of the tower was weak which failed to hold weight of the massive tower and it remained a faulty construction for ages. 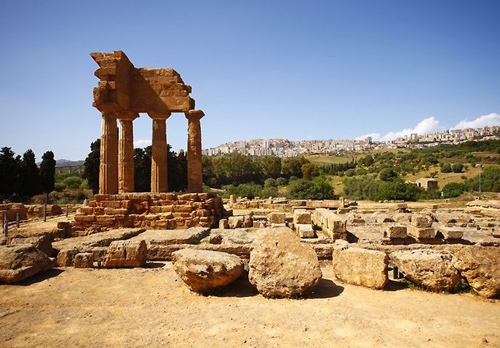 Experience histories unfold in front of your eyes with our guided Sicily tours. 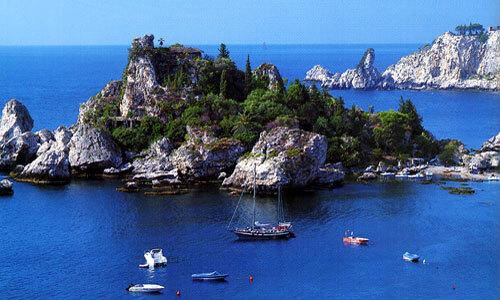 Sicily boasts of a lovely blend of tradition and modernism aptly depicted through its landmarks. Once being considered as the ‘America’ by the Greeks, Sicily offers spectacular sites including ancient Greek towns, former Roman villas, Europe’s highest active volcano- Mount Etna. Fragments of history can be traced at Palermo, Syracuse, Agrigento, Monreale and Taormina. Cruise around the Aeolian Islands on sailboat cruise and admire the land once inhabited by the Phoenicians and the Normans. A tour of Italy is incomplete without a visit to romantic Tuscany the land of rolling hills, ancient Roman roads fenced by Cypress trees and enigmatic Etruscan towns perched on steep hillsides. 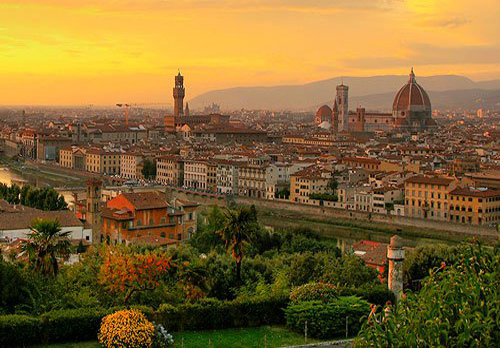 The Tuscan cities of art like Florence. Siena, San Gimignano, Cortona and others are unparalleled in the world while the countryside is dotted with farmstead mansions amid extensive vineyards and old olive groves. Fortified villages shelter important art work and tell wonderful tales about log-gone years. 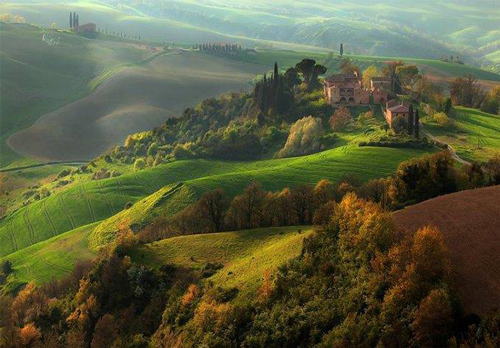 For tours in Tuscany select the option villa and farm vacations on the Italy Travel Tours web page. 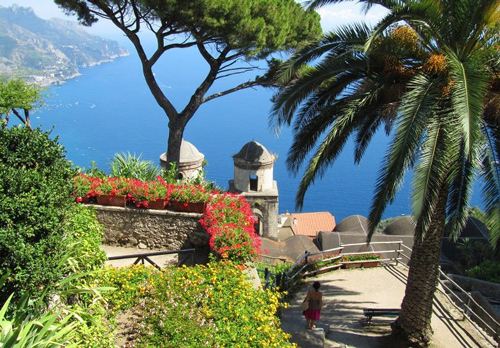 Surrounded by the Mediterranean, Italy has been at the center of Western culture for millenia. The Roman empire was one of the longest, and the city is full of ancient ruins and wondrous architecture. Florence has masterpieces such as Michelangelo’s ‘David’ and Brunelleschi’s Duomo; Venice is the city of canals and Milan is Italy’s fashion capital. Starting on any day you choose, take a flexible independent tour around one of the worlds most popular destinations. 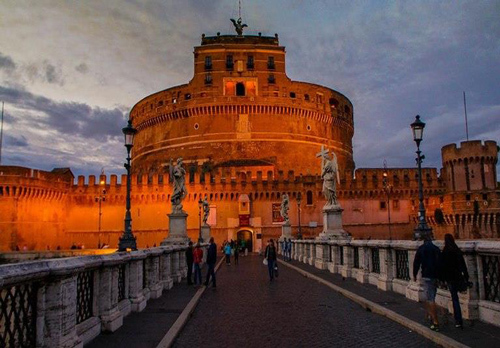 Rail packages connecting major art cities, driving tours to visit romantic countryside and short city stays in Italy’s most fascinating cities are listed on this page. We also offer cooking courses and music vacations. Sicily is the largest Mediterranean island. Explore the Valley of the Temples, the ruins of Doric-style Greek temples, and in the Byzantine mosaics at the Cappella Palatina. On the east coast is Mount Etna, one of the most active volcanoes in Europe.